An acclaimed landscape painter of autumnal and twilight scenes, Bruce Crane used a literal and detailed style before adopting the tonalism that characterized his later work. His popularity in the early 1900s attests to the continuing success of the Barbizon and impressionist modes in America. Born in New York City in 1857, Crane gained practical experience as a draftsman for an architect and builder. He began to paint in his spare time, later opening a studio in New York City. He received formal training from landscape painter Alexander H. Wyant, who influenced him to follow the Barbizon style. Crane continued to study in Paris for a year and a half, painting outdoors near Grez-sur-Loing. 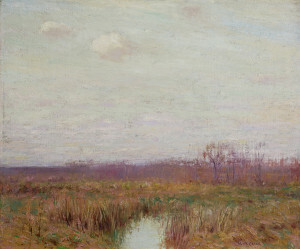 When he returned to New York in 1881, Crane achieved recognition for his plein-air landscapes of Eastern American scenes-the Adirondacks, Long Island, New Jersey, and Connecticut. His greatest popularity, however, came in the late 1890s, when he won the Webb prize given bt the Society of American Artists. Crane spent a great number of his summers after 1904 in the popular artists colony of Old Lyme, Connecticut. The artist sketched outdoors, as he once said, “to fill the memory with facts.” He used light-tone pigments, applied to the canvas with a scrubby brush to achieve a rough, dry effect. This is well illustrated in paintings such as “Autumn Uplands” (1908, Metropolitan Museum of Art) and “March” (date unknown, Brooklyn Museum), which rely less on detail and more upon beige, russet and brown tones to achieve their effect. In 1915, Crane joined with Emil Carlsen, Charles H. Davis, and J. Alden Weir to establish Twelve Landscape Painters, an exhibiting organization of artists working in popular representational styles. He died in Bronxville, New York in 1937.